The Prosecuting Attorney’s platform for reform was one of the main points of interest at the Whatcom County Council meeting on Mar. 12, 2019. The public meeting was called to order at 7:00 pm. Council members Barbara Brenner, Rud Browne, Barry Buchanan, Todd Donovan, Carol Frazey and Satpal Sidhu were present. Council member Tyler Byrd was absent. Approve the minutes of the Special County Council for February 20, 2019. Approve the minutes of the Special County Council for February 26, 2019. Approve the minutes of the Regular County Council for February 26, 2019. The new County Prosecuting Attorney Eric Richey shared proposed Platform for Reform. 9) Adding more data to their web site to increase transparency. There was one public hearing over an ordinance granting Deer Creek Water Association a franchise and the right, privilege, and authority thereunder to locate, set, erect, lay, construct, extend, support, attach, connect, maintain, repair, replace, enlarge, operate and use facilities in, upon, over, under, along, across and through the franchise area to allow for the provision of water services. Council member Barbara Brenner said this ordinance was held in committee but a public hearing was still held. The only one who spoke was Wendy Harris. She said the county was giving Dear Creek Water Association some very broad rights with this franchise and was concerned about things like public notice and ecological impacts. During the Open Session, citizens voiced concerns over parking schools buses near the creek, proposed changes to the Maple Creek Campground at Silver Lake Park, the homeless crisis, mental health and drug treatment, and climate change. 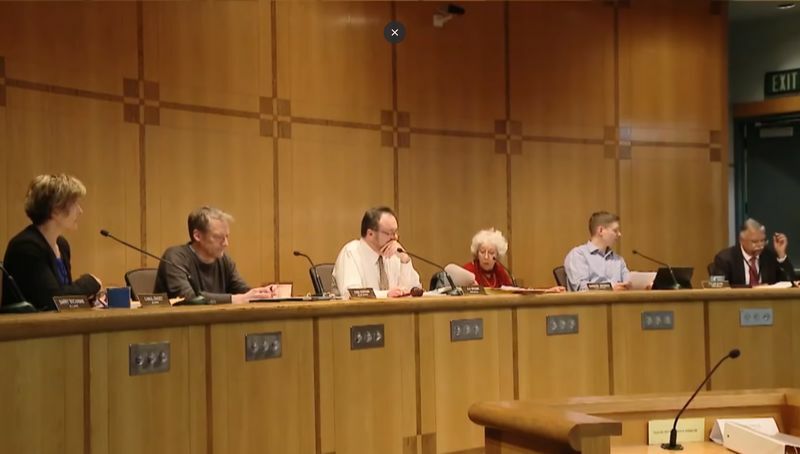 Item 1: An ordinance amending the 2019-2020 Whatcom County Budget, request no. 3, in the amount of $95,521. Passed without discussion. Adopted 6-0 with 1 excused. Item 2: Request authorization for the County Executive to enter into an Interlocal agreement between Whatcom County and Whatcom Conservation District to provide Lake Whatcom Homeowner Incentive Program assistance, in the amount of $216,883. Deputy Executive Tyler Schroeder said this money is for Lake Whatcom homeowners that want to do additional retrofitting of existing lawns to make them more stormwater valuable. He said there is already an interlocal agreement with Bellingham to fund for this contract. Authorized 6-0 with 1 excused. Item 3: Request authorization for the County Executive to enter into an Interlocal agreement between Whatcom County and City of Bellingham for GRACE Program funding, in the amount of $140,000. Passed without discussion. Authorized 6-0 with 1 excused. Item 4: Request approval for the County Executive to authorize the purchase of radios and related accessories from RACOM Corporation, an authorized distributor for Harris RFCD, using the Washington State Contract #02315, in an amount not to exceed $59,091.90. Item 5: A resolution celebrating April as a month of Sikh awareness and appreciation in Whatcom County. Council member Sidhu said this resolution was held in committee and will be presented at the next meeting with some updates. Item 6: A resolution docketing comprehensive plan and development regulation amendments. Each year the Council must choose which proposed comp plan and development regulation amendments will be docketed for further review. The proposed docket for 2019 has seven new applications and 16 previous applications initiated in past years. Council member Browne brought forward a couple of amendments to the proposed docket. The first was to determine the minimum safe distance to allow gravel pits in a parcel that has a petroleum pipeline running through it. Approved 6-0 with little discussion. Browne said taking sand and gravel from the meander zone used to be common practice before Ecology and the Army Corps of Engineers stopped it. He said “it’s an unlimited supply of sand and gravel that doesn’t involve the conversion of productive farm and forestry land.” Any proposal to do this would still need to go through the full permitting process. This amendment passed 5-1 with Council member Donovan voting “no” and Byrd excused. The amended substitute resolution was then approved 6-0 with 1 excused. The County Council was then asked to approve a letter from the County Health Dept. addressed to state legislators asking them to allocate sustainable and significant funding to expand foundational public health services in this legislative session. 1. Appointment to the Whatcom County Drayton Harbor Shellfish Protection District Committee – Applicant: Julie Hirsch (the Committee advises the County Council on proposed actions and operations relating to the restoration of water quality in the Drayton Harbor Shellfish Protection District). 2. Appointment to the Whatcom County Surface Mining Advisory Committee, Environmental Consultant position – Applicant: Shannon Logan (the Committee advises the Planning Department and the Council on implementing a surface mining regulatory program consistent with the Comprehensive Plan). 1. Ordinance Increasing Sheriff’s Office Petty Cash Fund. 2. Ordinance to Repeal Ordinance 2019-017. 3. Ordinance amending Whatcom County Code 6.04 Animal Control, Chapter 6.04.020 Definitions and 6.04.031 Administration and Enforcement. 4. Ordinance amending the 2019 Whatcom County Budget, request no. 4, in the amount of $2,260,652. 5. Resolution and Public Hearing regarding support for a Community Development Block Grant funding application. 6. Resolution requesting Council authorization of the release of covenants on the property known as the Playground Tract, Bennett Hill supplemental. Council member Sidhu shared a report from the County Executive saying that the bid to replace the doors at the jail came to $4.25 million – or $26,000 per door. The bid will come to the council for approval in the next few weeks. He also talked about approving $40,000 for Cascadia Law Group to get advice on the moratorium on new or expanded fossil fuel facilities at Cherry Point. County Executive Jack Louws said two high-quality local contractors bid to replace the doors at the jail. He said the high cost is the reality of keeping the current jail in operation. Council member Buchanan made a motion to support a Health Dept. proposal that would create a subcommittee to the Whatcom County Housing Advisory Committee to come up with policies to better prepare for sheltering the homeless during severe weather events like in February. The City Council voted 7-0 to support this proposal the day before. Passed 6-0 with 1 excused. Council member Sidhu talked about the Alaska Marine Highway, and the Alaska Governor’s proposal to close the ferry after October. Sidhu stated that if it only runs during the summer, there are 36 well-paying jobs in Whatcom County that would be lost, and local businesses that work with Alaskan communities along the Highway would suffer. Sidhu plans to bring a resolution to the council to send a letter to the legislators highlighting the importance of the Alaskan Highway to Whatcom County and to Alaskans due to business ties with Whatcom County.